Getting your oil really hot is the trick to producing crispy roast potatoes. Tonight we'll be having them alongside beautiful, flaky fillets of haddock generously crusted with herby, cheesy crumbs. Pure gold! Preheat the oven to 200 degrees. 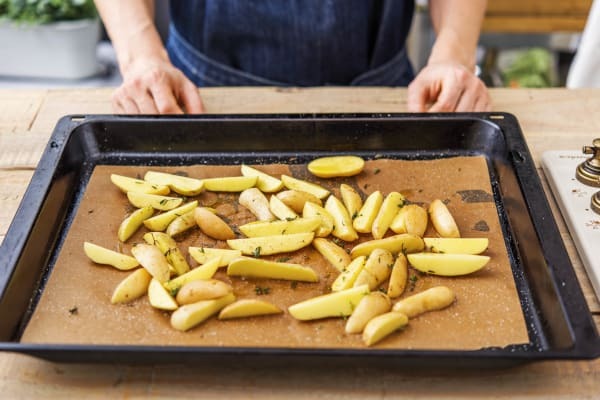 Pop a baking tray with a glug of oil into your oven whilst you chop the red potatoes into 2cm chunks (no need to peel!). Strip the thyme leaves from their stalks. Pop the potato on your baking tray with a pinch of salt and half the thyme leaves (discard the stalks). Roast on the middle shelf of your oven for 20-25 mins or until golden. TIP: Give the them a shake after 10 mins to make sure they cook evenly. While the potatoes roast, get the rest of your prep done. Remove the root and dark green tops from the leek. Quarter it lengthways then chop into 1cm chunks. 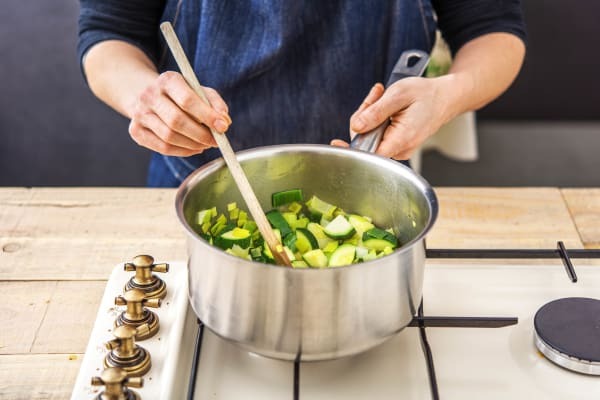 Remove the top and bottom from the courgette. 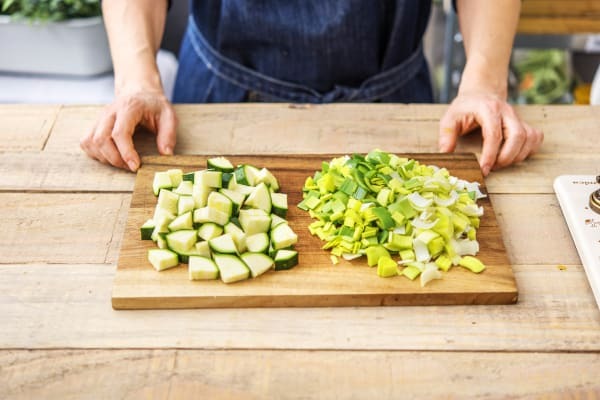 Quarter the courgette lengthways and then chop into 1cm chunks also. Peel and grate the garlic (or use a garlic press). 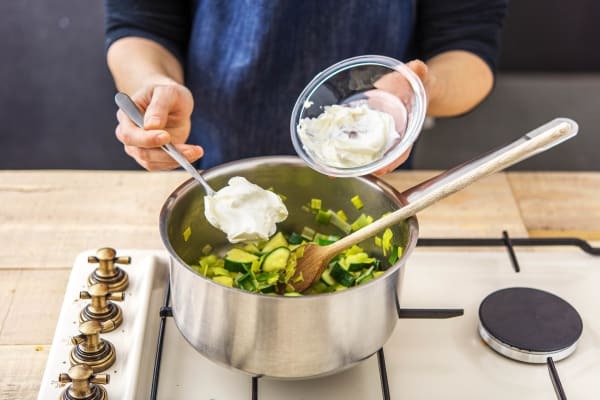 Pop the butter in a saucepan over medium heat and add the leek and courgette. Cook for 8-10 mins or until soft. TIP: Stir frequently to make sure it doesn't brown. 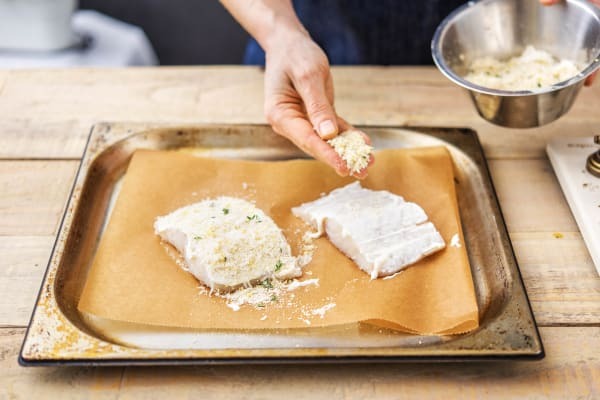 Place the haddock fillets skin-side down on another baking tray lined with baking paper. Season with salt and black pepper and spread a teaspoon of crème fraîche onto the flesh side of each fillet. Mix the hard Italian cheese with the remaining thyme, the panko breadcrumbs and a glug of oil in a small bowl. Grate in the lemon zest and mix well. Sprinkle the cheesy crumb over the crème fraîche and pat down gently to make sure the mixture sticks to the haddock. Increase your oven temperature to 220 degrees. Bake the haddock on the top shelf for 10-12 mins. TIP: You want the crust to be golden brown and the fish cooked through. Meanwhile return to the veggies. Add the garlic to the pan. Cook for 1 minute. Season with salt and black pepper and then add the remaining crème fraîche. Cut the lemon into wedges. 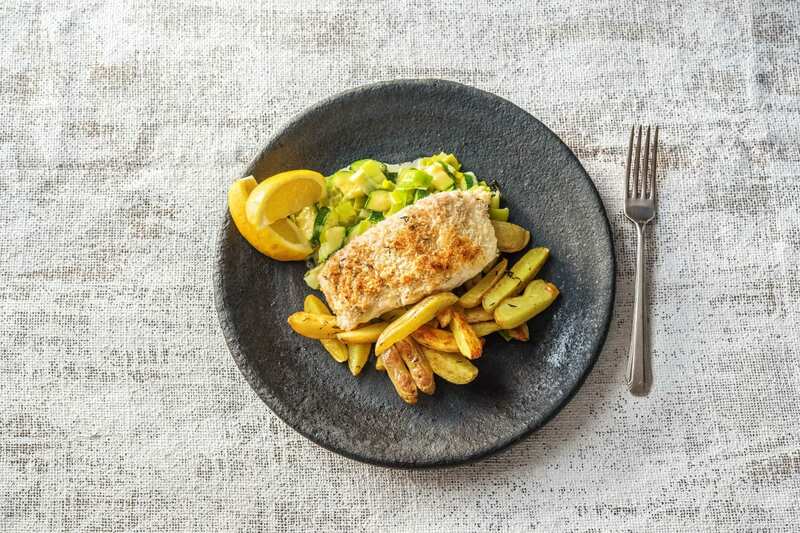 When the haddock is golden, spoon the creamy leeks into the centre of your plates. Surround with the roast potatoes and then carefully place the herb crusted haddock on top. Serve with a wedge of lemon and enjoy!